At what point does a comeback just evolve back into life? I was running on the treadmill yesterday- doing my four minute run interval absolutely overwhelmed with excitement at the idea of my four minute run interval- wondering to myself at what point my comeback morphs into the daily grind of a gym goer. Now that I am running again (on a treadmill, for four minutes at a time) I am in a permanent state of runner’s high. My body was in withdrawal for almost two years, and now that I have had a reminder of how it feels, I’m in a constant state of awaiting my next four minutes. 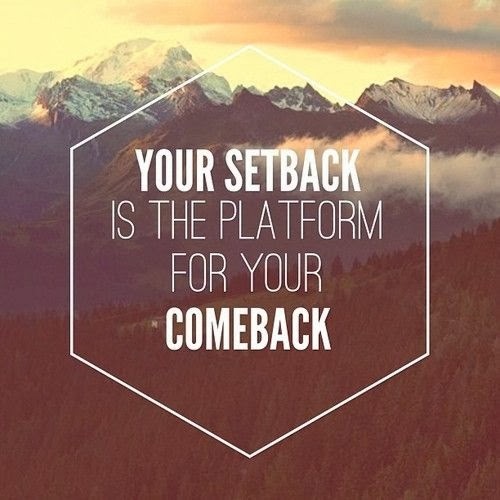 Maybe we would all benefit from the comeback mindset. The mental setting that we have much progress ahead of us, and each step forward is a milestone worth telling the world about. Every time we finish a workout there is a crowded arena screaming our name. Every time we lift heavier, our name is in the paper for setting new records. And every single rep we complete, we can remind ourselves, “I couldn’t do this before”. With the mental, physical, real, and imagined highs of the comeback journey, there must be the moments that bring our feet and faces back down to the ground; the universe giving us a friendly reminder that we aren’t as invincible as we briefly consider ourselves to be. Considering yourself to be in a “safe” place usually means that your face is about to hit the ground, so maybe embracing the comeback status is protective. As long as progress continues, combined with the awareness there is much ground to cover, I suppose it doesn’t need any label other than that.